At the present time, when so-called Islamic radicalism, terrorism and Jihadism occupy major media space, with Islam often depicted as the main culprit, the book attempts a tour de force. It proposes that Islam is as much victim as culprit in the history that has led to the current hostility. This is because the common claims of both mainstream and radical Islam that Islam represents the high point of the Abrahamic tradition, and therefore a purification of Judaism and Christianity, have been largely ignored, misunderstood or blatantly rejected by these faiths and therefore by `the West' in general. This rejection has effectively rendered Islam as the poor cousin, if not the illegitimate sibling, of the tradition. In turn, this has created long-term resentment and hostility within Islam as well as robbed the `Judaeo-Christian West' of a rich, inter-faith understanding of the wider Abrahamic tradition. The book explores these claims through textual, historical and theological analyses, proposing that many of them stand up better to critical scrutiny than has been commonly acknowledged. 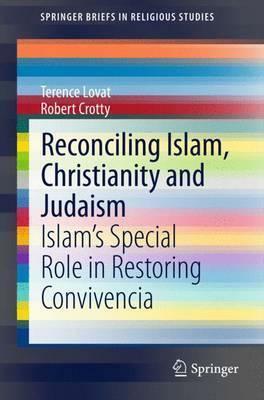 It further proposes that seeing Islam in this way has potential to re-awaken its self-understanding as a leader of accord among the Abrahamic faiths, of the kind that characterized the era of Convivencia when, in medieval Spain, Islam constructed and contributed to advanced civilizations characterized by relatively harmonious co-existence between Muslims, Christians and Jews. The book focuses on the role that a more respected and self-confident Islam could play in forging enhanced inter-faith relations in a world that desperately needs them as it struggles to understand and deal with modern and particularly vicious forms of radical Islamism. Illustrations note 4 Illustrations, black and white; XIII, 137 p. 4 illus. Section A: The Abrahamic Religions (Islam, Christianity and Judaism) and a Theory of Religion.- Chapter 1: An Introduction to the Abrahamic Religions.- Chapter 2: A Theory of Religion and Being Religious.- Section B: The Sacred Story(ies) of the Abrahamic Religions from Three Vantage Points.- Chapter 3: The Story from the Vantage Point of Judaism.- Chapter 4: The Story from the Vantage Point of Christianity.- Chapter 5: The Story from the Vantage Point of Islam.- Section C: Islamic and Islamist Scholarship and the Abrahamic (Ibrahimic) Tradition.- Chapter 6: The Heart of the Ibrahimic Story in Islam.- Chapter 7: The Increasing Cogency of Islamism.- Section D: Exploring Convivencia and the Potential for Islamic Leadership.- Chapter 8: The Historical Exemplar: La Convivencia.- Chapter 9: Re-constructing Convivencia in the Twenty-first Century.- Conclusion. Terence Lovat is Emeritus Professor (Philosophy, Religion and Theology) at the University of Newcastle, Australia and Senior Research Fellow at Oxford University, UK. He is a former Pro Vice-Chancellor and Dean at Newcastle, currently holding a full-time research position. One of his main areas of research (incl. funded) involves Islam with particular attention to its relationship with Judaeo-Christianity and `Western' civilization. He has won awards from Islamic groups for his work on Islam. Robert Crotty is Emeritus Professor (Religion and Education) at the University of South Australia. He is an eminent biblical studies scholar whose work has focused principally on the Abrahamic religions and their interface. He has written many books on Judaism, Christianity and has publications on Islam, including on the enigmatic role of Hagar, the Arabic wife of Abraham and mother of his first-born, Ishmael. Hagar and Ishmael constitute iconic sacred figures of both mainstream and radical Islam.